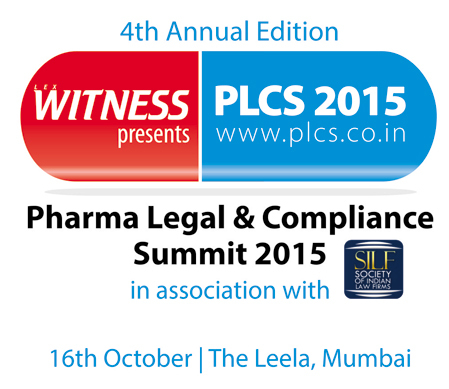 Lex Witness proudly presents the 4th Annual Edition of Pharma Legal & Compliance Summit 2015. The upcoming edition focuses on various legal and regulatory challenges the Indian Pharma Sector has been going through across domains like Compliance, IPR, M & A and Regulatory. The summit is framed around the opinions and suggestion of the industry experts themselves, which Team Witness has gathered through an aggressive research campaign. We hope that attending the summit shall help you and your colleagues to face the challenges that have gradually become a nightmare for the industry. The Indian pharmaceuticals market is third largest in terms of volume and thirteen largest in terms of value, as per a pharmaceuticals sector analysis report by equity master. The market is dominated majorly by branded generics which constitute nearly 70 to 80 per cent of the market. Considered to be a highly fragmented industry, consolidation has increasingly become an important feature of the Indian pharmaceutical market. India has achieved an eminent global position in Pharma Sector. The country also has a huge pool of scientists and engineers who have the potential to take the industry to a very high level. The Indian Pharmaceutical Industry has been one of the most vibrant and forward moving business fabrics of the economy. At the same time, the industry has been through roadblocks in terms of the stringent legal and regulatory environs of the country. The summit kick-starts "compliance" as its key mandate and focus as its Keynote Session. The session encompasses various aspects right from the manufacturing hubs to the doorstep of pharmacists. On the other hand, the digital boom hasn't been so well for this part of the India Inc. as players struggle yet to understand the regulatory aspects attached. And that's not all would there be a player who would confess non-compliance - if so why and how! Creating a property is where the wars begin from. In today's scenario of a rat race across industry sectors, protecting a creation for successful monetization happens to be the key to standing apart. The session elaborates on all possible strata of "Intellectual Property" right from the phases of implementing it and sustaining the commercial value. Having said that, counterfeiting happens to be struggle even today and unfortunately for the creators! M & A and FDI - talks of the legal corridors! India Inc. has witnessed and set benchmarks via noticeable mergers and acquisitions in place. Whether it is the pre-existing legal liabilities of an entity being eyed on for acquisition or a typical case of a merger, it is indeed a fine eye that's required to keep all checks in sync. Can there be master check list to be followed? Let's see what the experts have to say. The "Patents" ecosystem in India has been as innovative and inventive as the nature of the sector itself. The legal aspects around the patenting complexes include not one but many areas of complications and challenges at the same time. Whether, the introduction of a new product or licensing as a subject, the sector needs clarity and global intellect in place to combat the global pressures that India is currently facing. An overview of the topical talk points. "Regulations" by the literal sense intends at controlling and not limiting. Is there a misbalance between sentiments of a patient and that of the industry? Is there a need of relooking at Regulations from a global perspective? Howsoever, complicated and complexed the situations may be, it is inevitable for the industry to adopt and comply with the regulations in place, and keeping all business interests in place as well. Listen to the veterans to know the award winning secrets.